ANGLER’s mobile app developers analyse the scope of your business and targeted customers to craft your business-specific, mobile applications which completely put the business reins in your hands and empower you to drive up your ROI. We have a talented pool of mobile app developers, highly-skilled analysts, UI & UX experts well-versed in building apps for all the major platforms whether it’s iOS, Android, or Windows Phone. With our Mobile app development solutions Apps can be developed natively, or by using cross-platform frameworks and platforms such as PhoneGap or Xamarin. We deliver expert mobile application development services from our Offshore Development Centre (ODC) so that you get high quality apps at affordable prices and empower your business to advance over your rival businesses to enjoy a distinctive competitive edge. 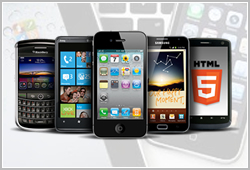 With our unique mobile application development services, we have created mobile apps of any complexity: from simple to heavy enterprise-grade mobile solutions that automate mission-critical business processes. Why ANGLER for Mobile Development?